People are watching as the gang approaches from down the street. There are about 10 of them, each tethered to a pit bull, all in uniform and on a mission. Pit bulls are warm, friendly, family dogs and not at all like the caricatures that have been portrayed as in recent years. Ewing, a graphic designer and social media consultant, is about as far from the stereotype of a pit bull person as you can get. Ewing, a foster mom to rescued pit bulls, has just placed Harry Potter in a great new home. Harry was found abandoned and starving near the Mexico border. “He refused to believe he was anything but a lap dog,” she said. In fact, pit bulls are as much an “everyone dog” today as they were 50 years ago when they were known as “America’s family pet” and, in the UK, as nanny dogs. And while Labradors and Goldens have been claiming that particular title more in recent years, pit bull people span the social spectrum, too. Here are some examples of that. At her Hudson Valley estate outside of New York City, Marilyn Cohen is checking on lunch. That would be lunch for China, her 11-year-old pit bull who has cancer and is on a special diet prepared by the chef. Cohen, after all, is in the business of good food – she owns two top-rated restaurants in Manhattan. So only the best is good enough for China. China is Cohen’s second pit bull. Cohen’s husband, Dan, is an Israeli film director, who’s worked mainly in Germany and is best known in the United States for his 1978 movie, Madman, starring Sigourney Weaver. Today, he’s at work on a novel that tells a fictionalized version of the family’s pit bulls, which he’s also planning on making into a movie. Does your State Senator have a pit bull? Connecticut’s does. 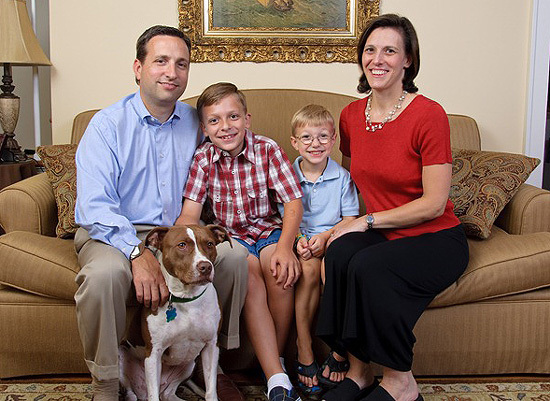 Equally passionate, and a staunch member of the unofficial community of pit bull people all across the country is State Senator Bob Duff of Connecticut. “My family and I have adopted two abandoned pit bulls, welcoming them into a home with two small children without fear. We’re proud and lucky to have them in our lives,” he said. Christine Craig grew up in Miami where her parents had emigrated from Haiti in the 1960s. She recently received her MBA, and has been in marketing for several years. “I couldn’t have told you what a pit bull was,” she said. But she adopted one of the puppies after her ex-boyfriend’s pit bull had gotten together with the Rottweiler across the street. Craig thinks that most people assume that pit bulls are a man’s dog. “Their perception of the dog doesn’t match their perception of my personality. But that just means they don’t know pits!” she said. Across the country in Las Vegas, Tino Sanchez believes that most people in his part of the country really do understand pit bulls. He says they know that most of the fear of pit bulls is fostered almost entirely by the media’s negative portrayals. 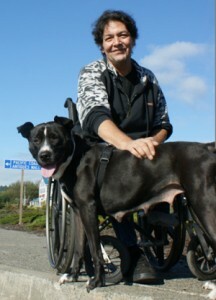 Sanchez, a disc jockey, is a regular volunteer at the city animal shelter, and helps get the dogs ready for new homes. 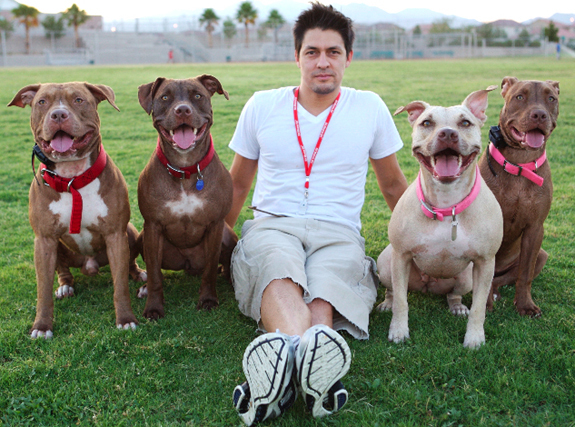 Right now he has five pit bulls at home, two of whom are certified therapy dogs. At either end of the economic spectrum you’ll find Gary Michelson, a California, Forbes 400 billionaire and the spinal surgeon who invented spinal implants, and David Love, a homeless man in Brookings, a small town on the Oregon coast. As a dog lover and, especially, a pit bull lover, Michelson is using much of his wealth to help animals, offering $25 million to the first inventor of a safe and effective injectable sterilant for cats and dogs, and another $50 million to support the research and development of the product. His goal is to replace spay/neuter surgery, which is comparatively expensive and time-consuming, and so to reduce the numbers of unwanted, homeless dogs and cats coming into shelters. In a different way, Love also strives to do the right thing for the world around him. On any given day, he can be found checking on his friend, Buddy, another homeless man, who, like him, gets around in a wheelchair. Buddy lives more than two miles away. But it’s an easy ride for Love. Love has several medical problems, and Kitty has become his lifeline, who enjoys her daily exercise pulling the wheelchair around town. 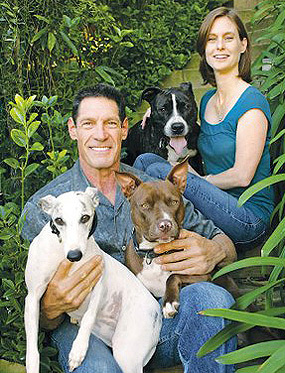 During the week, David Isaacs is a media entrepreneur, but he often takes time out over the weekend to help find homes for homeless pets. One Saturday morning, he was volunteering for a local rescue group at a table outside a pet supply store on the Upper West Side of New York City. One of the dogs the group was hoping to find a home for was a sad-looking pit bull. “Molly was cowering under a table, so I offered to take her for a walk,” Isaacs said. “I took her for a stroll in NYC’s Central Park. She had a long scar along her back, and she was just terrified, grazing against the wall next to the footpath. I sat down with her, hoping to calm her down a bit. Moments later, she crawled into my lap, curled up and went to sleep.” Isaacs took her home and she’s been part of the family ever since. Isaacs studied law at Harvard and then at the Harvard Law School, where he was in the same class as Barack Obama. Today he lives with his wife and young daughter in Santa Monica, Calif. So who’s a pit bull person? From presidents (Teddy Roosevelt and Woodrow Wilson) to pop stars (Pink, Madonna and Usher); TV personalities (Jon Stewart, Cesar Millan, Rachel Ray and Dr. Phil) to athletes (Shaquille O’Neal, Serena Williams, Anthony Kim and Amare Stoudemir); and actors (Jessica Biel, Michael J. Fox, Jamie Foxx and Brad Pitt) to legends (Helen Keller, Thomas Edison and Humphrey Bogart), pit bulls are the beloved pets of people of every kind. So, you think you know a pit bull person? It’s easy; they’re really no different from anyone else! great article, thank you. i just lost my lab pit mix on friday. she was the best dog and mamma dog to all of my fosters. are you linking the patrick miracle to help change the perception of the pitbull? over 100 thousand people are fans. also, there is a wonderful man down here in s.central “dogman” featured in this months “dog fancy” magazine. he for years has been providing free training to pit bull owners every sunday. his contribution to save the breed is huge. check him out. and you may know john shipe “pit bull blues” song. it’s fantastic. @SandyZalagens Thank you for your comments, we are so sorry for your loss. We will check out the man providing free training to pit bull owners, what a fantastic idea. Our fans are already aware of Patrick as he is quickly becoming another good ambassador to the breed, with his incredible strength to recover and his forgiving nature. Most would say, ‘he’s a typical pit bull.’ Thank you for your support of StubbyDog. @DanThompson Thanks Dan! He is quite a beauty, love his markings. If you would like to share his story with us, we would love that. Please email [email protected]. Love this article 🙂 People always say pit bull / staffie owners must be scum themselves wanting vicious dogs and I get quite offended! Great to have an article to point them too! 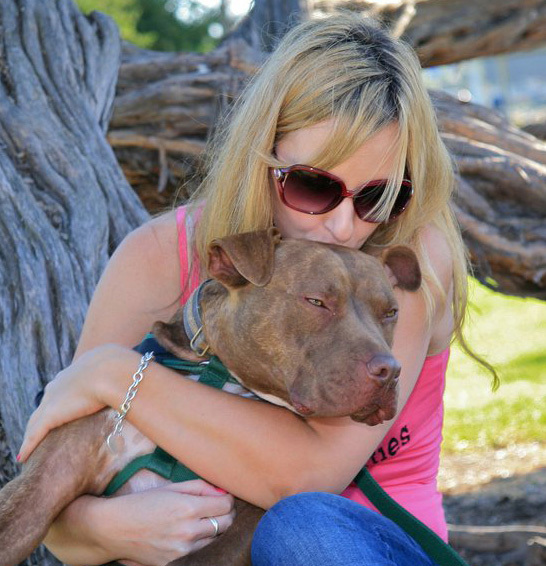 @Astrid_Brett Glad you liked the article and will use it to open some eyes about pit bulls. Thanks Astrid! I am the person that was lucky enough to adopt Harry Potter and I can’t express how great of a dog he is. He is a true companion to me and my other pit bull “Bubble’s”. I encourage anyone thinking of adopting a dog to please look at your local shelter or rescue organizations and consider this breed. @chicagodoobie Thanks so much for your comments, we are so glad that Harry is a wonderful addition to your home. Sounds like he was lucky too. And thanks for your message to adopt pit bulls. @JohannaFalber-Mcvay Thank you for sharing your story. It is wonderful you used the opportunity with your neighbor to educate him and you seemed to have gotten through to him. Thank you for rescuing pit bulls and setting such a good example for others and being an advocate for pit bulls every where. Together we can all help to change perceptions and you have truly proved that. Thanks for your support! I’m can’t imagine my life without my boy Dexter!! He has taught his sister, Molly (a shy, nervous Sato rescue from PR) how to trust humans and that human touch is most enjoyable. He is nothing but a lover and snuggler! He was the Monmouth County SPCA Honorary Chairdog at the 2010 Pet Walk and recently was on our local News 12 The Pet Stop, promoting a great Pitbull Event the MCSPCA just held last week. I take pride it educating people who are scared of Dexter just because he is a Pit Bull…after a minute with him…they fall in love with him… My hope is that they will now not judge a book by is cover and treat each dog they meet as an individual! @jeepkmd Thanks for your comments and all you do to educate people about pit bulls. Your dog sounds like a perfect ambassador to pitties every where! @StubbyDog @SandyZalagens re the patrick miracle…i have shared your article on their page…people seem to really be appreciating what you wrote. i pray that the 103 thousand supporters of patrick become ambassadors for our sweet pit friends. thank you!! @SandyZalagens Thank you Sandy! We hope so too! Just another pit bull person weighting in….my two pups are Ares and Xena, both rescued from Animal Care & Control in NYC, straight off the euth list. They are fantastic…soft, gentle, loving, wiggly, cuddly, and exceedingly tolerant. They excel in obedience class, have boundless enthusiasm, and adore every adult and child they meet (Xena also loves other dogs, while Ares is more selective…but that is something we know and take care to manage). And us? My husband and I are college grads (in my case, an MBA), white collar professionals, own our home, and are expecting our first baby in 4 weeks. There are obviously pit bulls who are bad to people (there’s a story in the media daily), and even more people who are bad to pit bulls (just in recent weeks, we’ve heard about Patrick in NJ, who survived, and Snoop in WI, who sadly didn’t)…and I am sure those two ends of the spectrum are highly correlated. But a well tempered pit bull (or pit mix) who is loved and trained and properly cared for by a good owner or family is going to be about as wonderful a dog as you can find. I’ve had shepherd-type dogs before, retrievers, and hounds, and when it comes to loyalty, playfulness, and the ability to really connect with their people, I find pits to be unparalleled. @seaaphrodite Thank you so much for your comments. Xena and Ares sound like wonderful dogs with a wonderful family. Congrats on your new baby and thanks for weighing in, it just shows that all kinds of people are pit bull people. This article definitely provoked a few tears. I am the proud mommy of one 1/2 pit 1/2 lab, and one full pit. Both babies were pulled from severely abusive homes, and today both are completely well adjusted family members. I’d like to add that when I was 11 years old I received 300 stitches in my face from a dog attack. It was NOT a pit, it was a completely different breed. Gable (now 10 years old, I adopted him when he was 6 months), survived Lymphoma. Much like Marilyn Cohen, I stopped at nothing to get him the treatment her required. I’m proud to report that he has been in remission for two years! 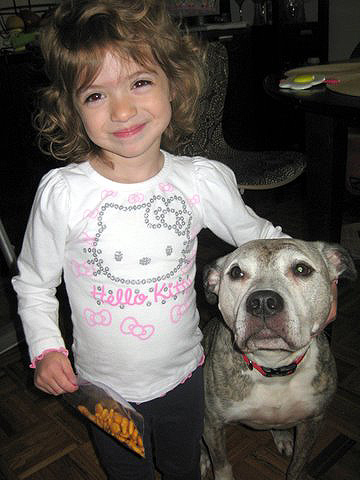 Kira (now 9, adopted at 9 months old) was rescued from a fighting ring in the Bronx. I have no idea how she survived that bc there isn’t a mean bone in her body. My mother’s 8lb Yorkie dominates her. I will always rescue, and I will always seek out Pits. They are the absolute best companions in the world. Thank you for this wonderful article. Just loved this article. I was one of those OMG they are mean dogs people. Then one day my daughter brought home this adorable red puppy. She told me he was a Jack Russell mix. He was so little and such a love. Our Mastif and him became fast friends. As Short Stuff grew, my friends kept saying he looked Pitty. I told him no way, but because I really had only seen the media version, I looked Pits up. Well to my surprise Short Stuff was a Pit. I asked my daughter where did you get him? Well she bought him off the city street, because the kid walking this tiny puppy said he was kept with the fighting dog. She offered him her whole pay & he handed over the dog. Now Short Stuff, never lost his temper, was super smart, and the best companion. Sadly this wonderful love died from a very aggressive cancer at the age of 10. Daugher also brought home a beautiful young brindle pit female who was being ignored & kept only in a crate. This lady is my shadow even at the age of 11. She is the motherly type who cleans the Bulldog as if she bore him, and he is 8. So now I am an advocate for Pits, especially to the OMG people. When my kitchen was remodeled the guys who worked on it could not believe my 2 Pits. They said the last thing they ever thought was they would be sitting down, eating lunch with 2 Pits laying at their sides! Perception changed. Articles like the one above, and others, I believe, are changing media perception for the good. @2Encores Thank you for sharing your story of your pit bulls. we are so glad your perception was changed and now you are helping to change others’ perceptions with your sweet dogs. 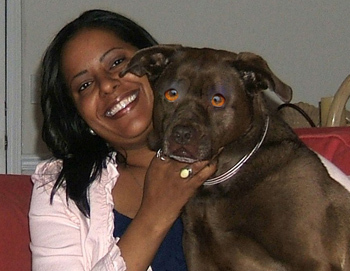 The picture of the brown dog with the Photoshopped eyes is scary! Pit bulls are cute enough without messing with them in PS! Conformation for amstaffs are either almond shaped eyes or round eyes. Round is not as common and might startle some people just because of that. Also many pit bulls up for adoption are pit bull crosses. It was noted in the article that the dog was a cross. @fkugor I think the eyes were photo shopped because the dog looks like it has ectropian (where the eyelids sag). Where that stupid orange colour is was probably red. I guess they thought that would look better. It doesnt. At least try using black instead, that would be more natural. @rn4pitbulls Sounds like a great idea!!!! The article should also have mentioned that Fred Astaire was a longtime pitbull owner. I think most people might be surprised by the image of the elegant Mr. Astaire and one of his beloved dogs…. Im a pitbull person!!! And Im so proud of my babies!!!! I LOVE this article!! If there is a sterilant for animals…think of how many wouldn’t die in shelters!! Mr Michelson, thank you!! Everyone in this article rocks!!! !THANK YOU!